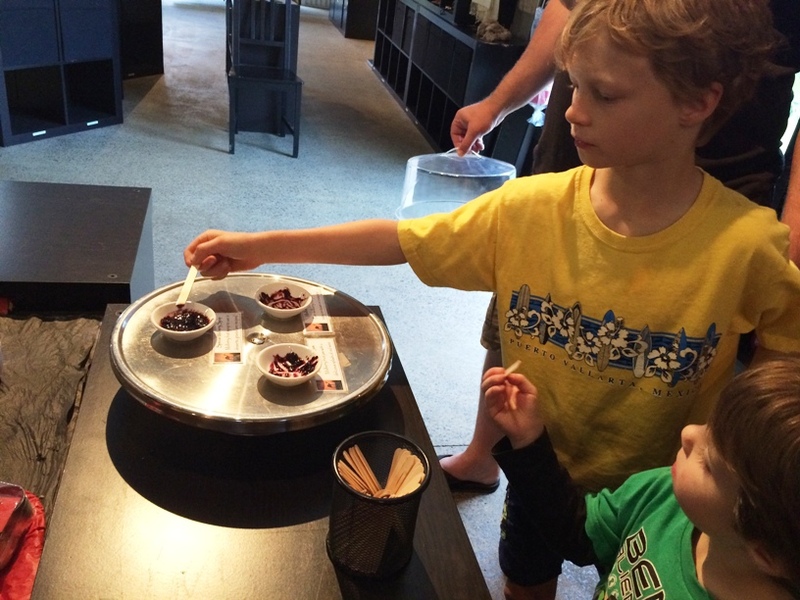 Taste your way around Margaret River on our free sampling trail. 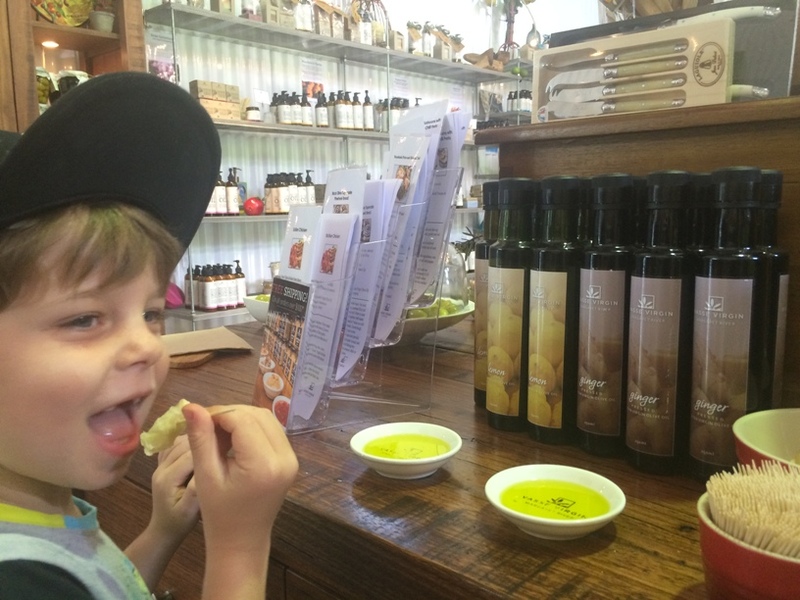 Margaret River is known for being a wine tasting paradise but also has lots and lots of local produce sampling opportunities that don't involve alcohol, so the whole family can come along for the ride. 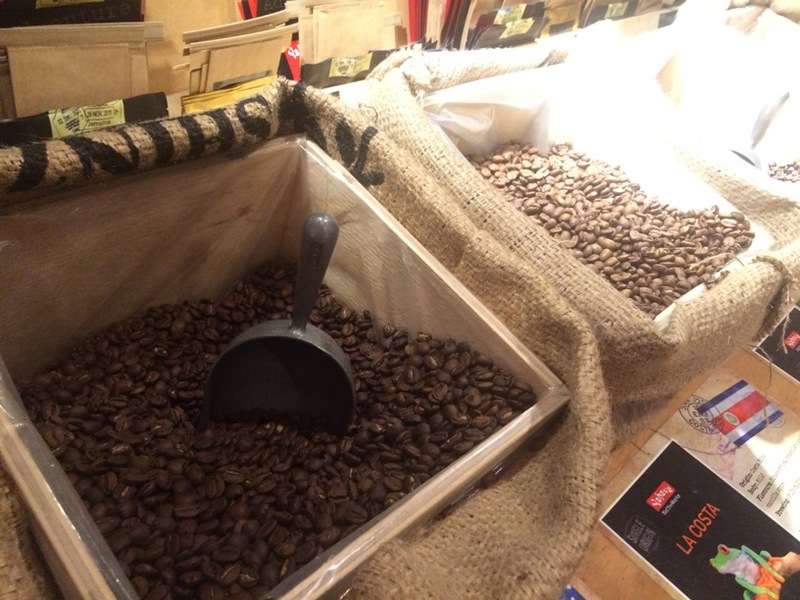 While this is not an exhaustive list, here are some of our tried and tested sampling experiences, and we have listed them below in an order that you can follow from beginning to end without doing too much back tracking. We have accumlated this list over many years so you may need to break the trail up and try a few each day you are visiting, or save the rest of the list for the next time you visit. And if there is a good one we've missed, contact us to let us know, or feel free to share via Instagram, facebook or twitter using #kidsaroundperth. Oh and just a word of warning.. while this trail is full of free sampling experiences, the local produce in Margaret River is world class, so don't be surprised if you find yourself reaching into your purse to purchase some nice fresh jam to take home or a bottle of olive oil to gift as a souvenier for loved ones at home. Tip: Bring along an insulated bag and an icepack or two to keep anything you buy nice and cold. We are going to start in Witchcliffe which is around 10 minutes south of Margaret River. Then work our way back towards town but head a little east, before coming into the town centre. From here we will explore the south of Margaret RIver and come back towards town from the west. You can start wherever you like, we have listed them in an order that makes it easy to drive from one ot the next. 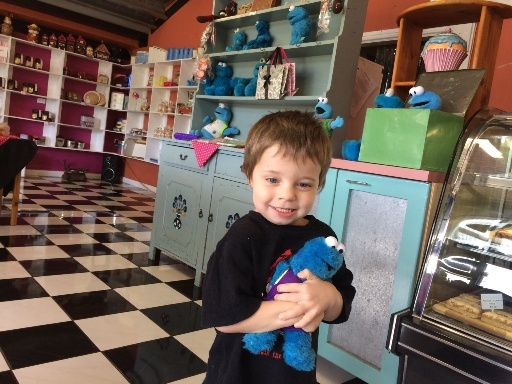 Find out where Cookie Monster goes when he is in town. Where else but Cookies Galore Witchcliffe. As the name suggests its mostly cookies, of which you can sample many flavours. They also have a lovely selection of other sweet treats and hot drinks and a little indoor and outdoor dining area (dogs welcome outside). You don't want to get too far into your sampling trail without getting your coffee fix, so a stop at Yahava Koffeeworks next is perfect. 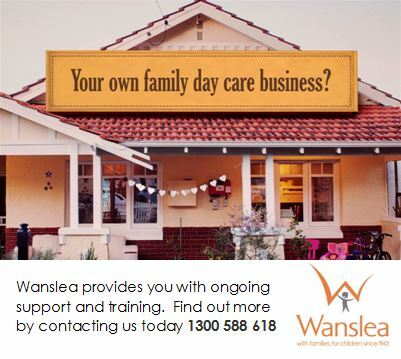 Yahava is located only a few minutes south of Margaret River town just off the Bussell Hwy. Open daily from 6.30-5pm (8-5pm on the weekends) - you can pop in here any time to taste test some of their award winning blends. There is a big grassed area outside so this is a great spot to let the kids run around. Or if you don't want to stop... Yahava has Margaret River's first and only drive through coffee too. Located in the same complex as Yahava Koffeeworks, is Temper Temper. Here you can taste some fine chocolates in a range of combinations you wont believe. A great one for the lover or raw foods too with cacao chocolate flavoured with a range of organic nuts, fruit and spices. Also located right alongsie Yahava & Temper Temper is Vasse Virgin. They also have a bigger store south of Margaret River in Wilyabrup where you can test a lot more of the soaps and body creams. However this little store is also worth the visit with lots of tasting opportunities. Of course there is the bread with olive oil, but also mustards, jams and lots of other gourmet foods. The staff here have a wealth of knowledge about all the product contents, local origin and have fantastic suggestions for what foods each condiment compliments. 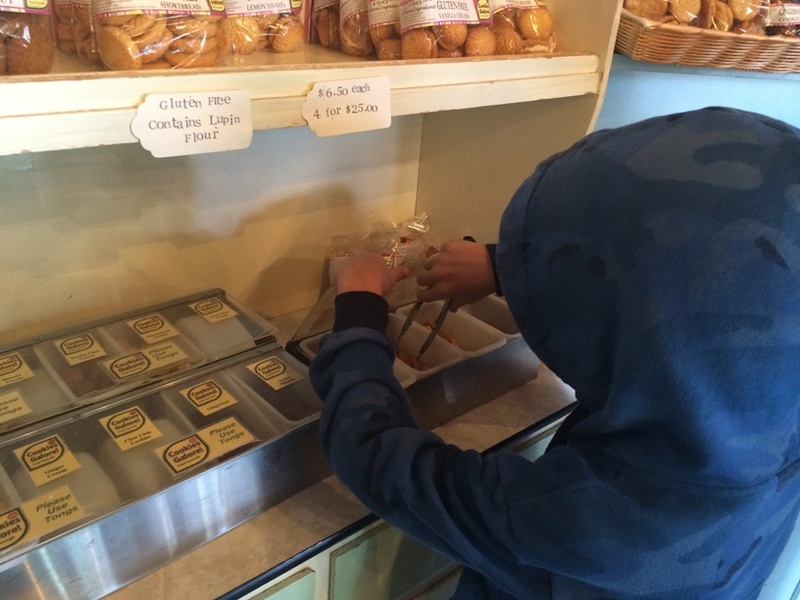 The next stop, The Berry Farm, is about 20 minutes from the Bussell Hwy. 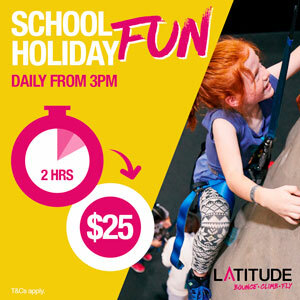 This stunning spot has it all with playground, cafe and of course free gourmet tastings. 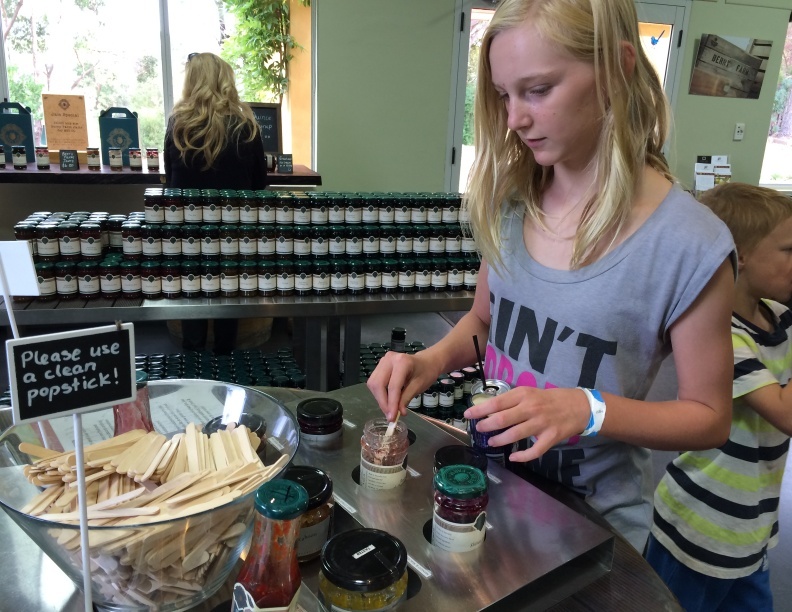 There are jams, preserves, syrups and dressings with over 40 tasting opportunities each day. 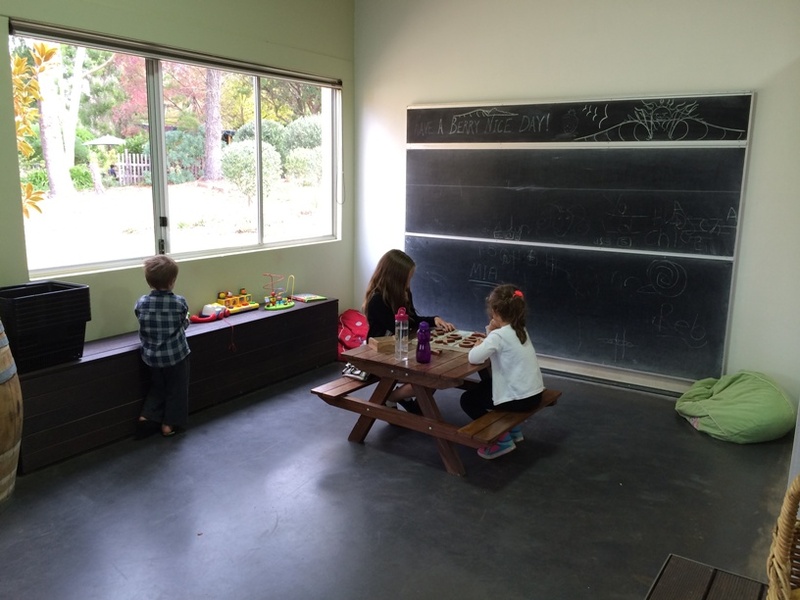 They have a great little kids play corner, so they can have a play while you taste too. 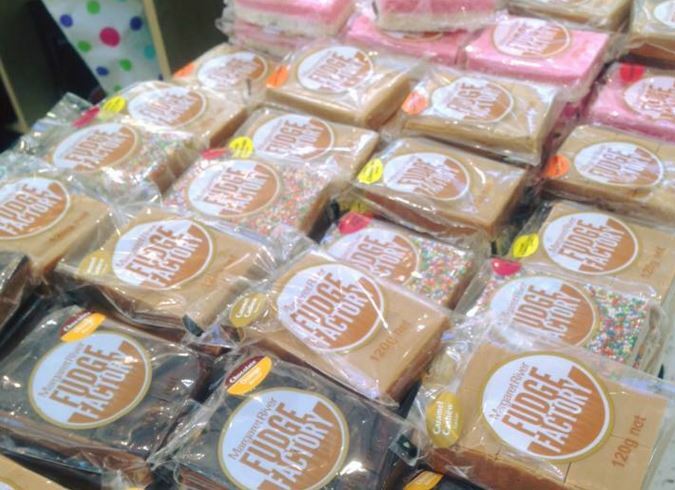 Heading back into the Margaret River Town Centre, stop at the Margaret River Fudge Factory to watch their yummy fudge being made and try lots of of different fudge flavours. 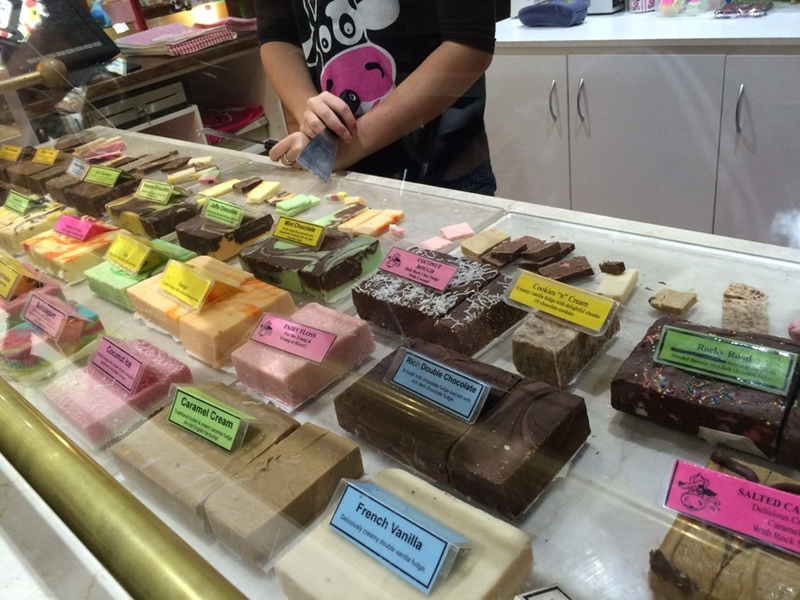 Heading south of Margaret River is another fudge tasting experience at The Candy Cow in Cowaramup. If you are visiting in the holidays or on the weekend try to time your visit for 11am for the Honeycomb Pour demonstrations. If you've over endulged a little on fudge by this stage you can enjoy a walk through Cowaramup also know as "Cow Town". It's lined with lots of cow statues. The kids will love counting them and having their photo taken with them all - a wonderful must do free Margaret River experience. Just a short drive from Cowaramup and just off the Bussell Highway is the Margaret River Dairy Company. 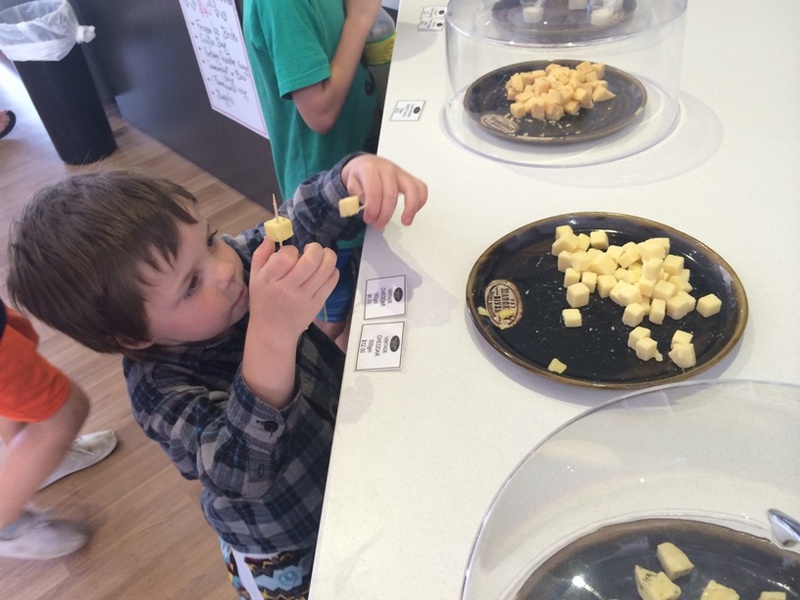 Here you can sample a range of cheeses and yogurts. It's the perfect place to taste some cheese and top up your supplies for your night time cheese platter over a glass of wine. The kids also love tasting some yoghurt and choosing one to buy to have for breakfast in the morning. The insulated bag and ice packs you packed will come in handy if you grab some goodies here. or you can also buy little cooler bags and ice packs here. Back in the car and we are now heading west from Bussell Hwy down Harmans Mill Rd. 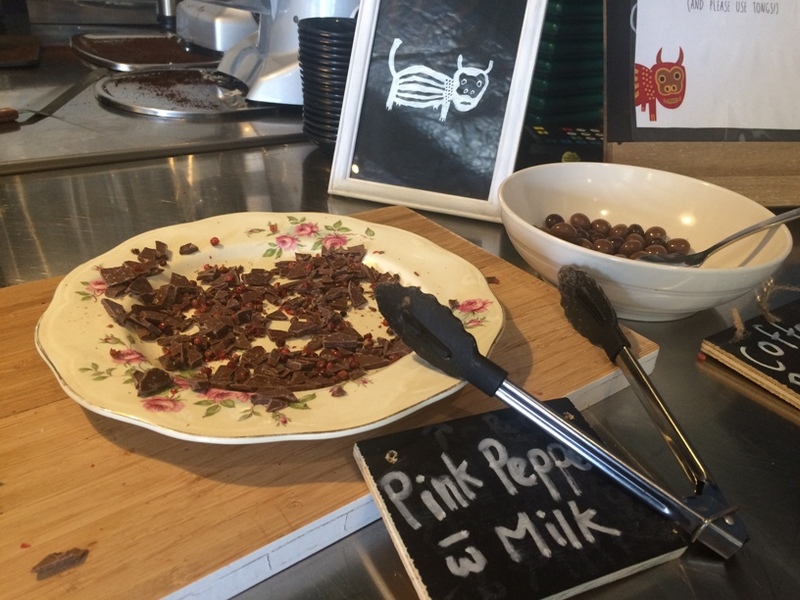 We have a few sampling stops on this road - the first is Margaret River Nuts & Cereals. Here you can sample a range of grains, cereals, nuts combinations and jams. 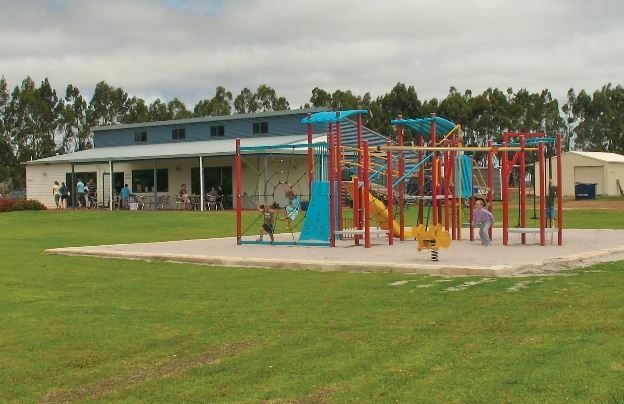 There is a great playground and big grassed area with a soccer net so it's a great spot to stop and have a run around and a play before you are about to endulge in the chocolate samples at the Margaret River Chocolate Factory down the road. Silk Road is home to Margaret River's Silk Worm Farm where you can sample mulberry jams and preserves. They also have a great little cafe that usually has a coffee and cake special or you can enjoy one of their mulberry tea infusions. 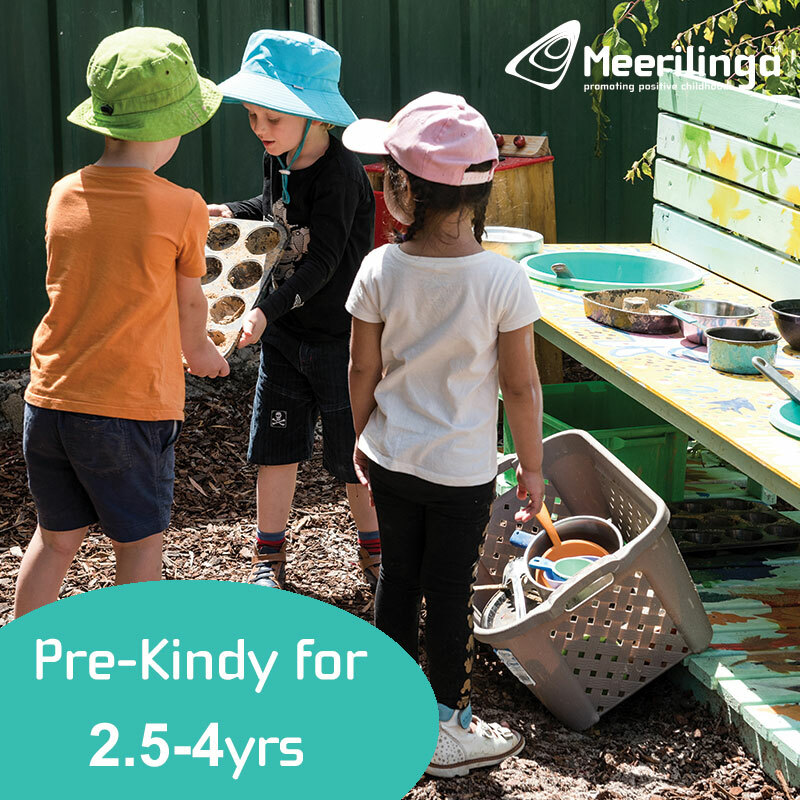 There is plently of room for the kids to run around, they can check out the hot house to see the mulberry trees or enjoy a silk worm life cycle talk. Back into the car for a drive for a minute or so continuing down Harmans Hill Road, and you will find the Margaret River Chocolate Factory. 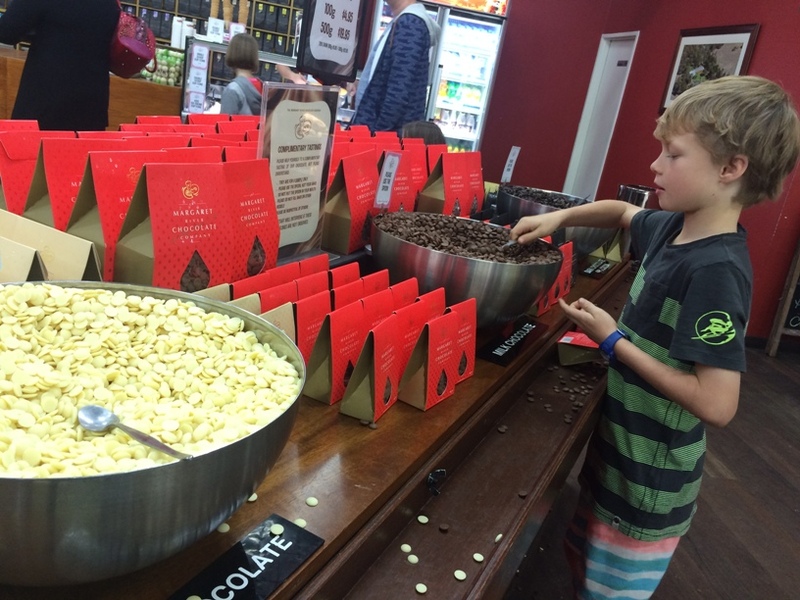 Probably the best known and most popular sampling experience and is a must do when you come to Margaret River. There are three bowls of chocolate drops for free sampling, one dark, one white and one milk chocolate. Simply fill the spoon and tip into your hand and enjoy. Kids will also love playing hide and seek behind the tall tress on the big grassed area out the back. Back inside there is a big viewing window so you can watch the chocolate being made. There is a lovely cafe here too if you want to stay a while. So that concludes our Margaret River Free Sample Trail. It's by no means an exhaustive list there are still penty to explore and discover and we will add more to the list as we check them out. Below we've embedded a map to help you find your way around.